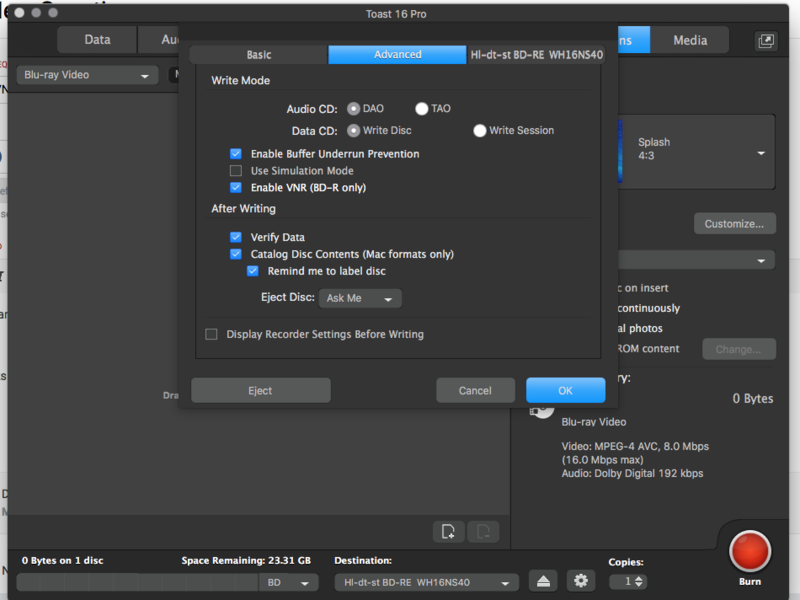 Does anyone know what the hell VNR is in the toast recorder advanced settings.. says it only applies to BD-R's. VNR stand for Verify Not Required. It is a flag setting (on/off) to skip verify IN HARDWARE what was written while it is written, directly, in small steps. It has to do with Hardware Defect Management in the drive at write time, only applying to BD-R discs, and involving reserved space for corrections. With VNR off, burning may get more reliable. With VNR enabled, drives may burn faster, as the verify step may get skipped. VNR can be applied to some of the low level writing strategies [WRITE (12)]. As it is a hardware feature, it is also drive specific how the setting behaves. The setting has no influence over the Verify after writing setting in Toast, a SOFTWARE feature, that verifies (but doesn’t correct) the disc as a whole. This may be the first instance of mentioning VNR on the Roxio forums, heh. Perhaps others aren’t as curious. The feature has been around since 2008 or so, and in Toast since v14 (2015).